In order for the sails to turn they have to be turned into the wind. In tower mills this is achieved by rotating the whole upper-most storey of the mill, or as it is known, the Cap. In the picture above you can clearly see a number of the Trolley Wheels. What is not visible in this picture, as at the time this photo was taken they had not yet been fitted, are the horizontal Truck Wheels. These wheels are fitted to the bottom of the shears so that they run around the side of the Curb at the base of the Cap. The purpose of these wheels was to stop horizontal movement of the Cap. An example of one of the original Truck wheel mountings can be seen in the picture below right. It is also of note that below the Trolley Wheels and Curb can be seen the notches that would contain cogs that the Cap Rotating Mechanism would mesh with. 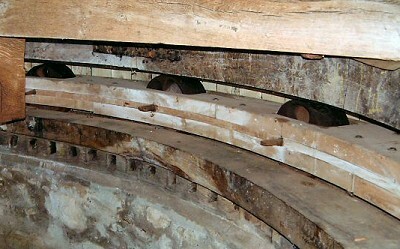 In this mill at regular intervals around the Cap's base are mounted a series of Trolley Wheels. These are attached to the Cap and run around in an iron track built into the Curb which is fixed to the top of the Tower. The picture below left shows the sections that make up the iron track as seen on top of the mill before the new cap was fitted.